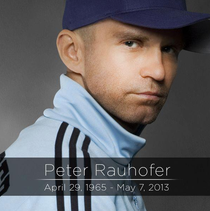 Absolutely gutted to hear the recent news that Peter Rauhofer had died. As a big fan of his productions, Peter used to freely release some absolute gems… underground tracks and dynamite remixes of huge artists that crossed the thin line between commercial and downright slammin’. Particularly in the UK, where commercial clubbing seemed to be on a pop/urban overload, Peter would release mixes of Rihanna and Madonna that made them cool to play. He was that good. The man behind Star 69 Records, Peter sadly passed away today having lost his fight with brain cancer, three weeks after his management released the terrible news that Peter was fighting the illness. The New York based DJ/producer will be sorely missed on the NYC scene. Peter was born in Vienna, Austria and is survived by his mother, Helga, who is expected to transfer his body back home to his country of birth. It was in his adopted birthplace of New York City that Peter’s star did shine. As well as his own many productions, he remixed for a who’s who of premier pop stars and icons – Whitney Houston, Britney Spears, Mariah Carey and Madonna all got the Rauhofer magic. And let’s not forget Cher, where his remix of ‘Believe’ in 2000 earned him a Grammy Award for best Remixer of the Year. Seek him out online, find his mixes and download what you can, you won’t be disappointed. Rest in peace my friend, your music lives on.